One of the most tragic figures of European royalty is the Empress Maria-Feodorovna, widow of Alexander III, and mother of Nicholas II of Russia. Her parents were the impoverished Prince and Princess Christian of Schleswig-Holstein-Sonderburg-Glucksburg. A family of modest means, the Glucksburg, as they were commonly known, raised their numerous progeny in an unostentatious, pious, yet carefree environment. Not one person would have imagined that the Glucksburg children would rule in Denmark, Greece and Norway. The family also provided royal consorts for the thrones of Russia, Great Britain, Hannover, Romania and Spain. In fact, their progeny would extend its influence throughout the European continent, giving Prince Christian and his wife, the title of "grandparents of Europe." One of these marrying Glucksburgs was none other than Princess Dagmar of Denmark, better known as the Empress Maria-Feodorovna. Small-framed and vivacious, Dagmar was born at the family's modest home, the "Yellow Palace," in Copenhagen on November 26, 1847. At the time of Dagmar's birth her father served in the small Danish army, while her mother, born Princess Louise of Hesse-Cassel, tended to the growing family. The family's finances were so strained that both parents actively participated in the education of Dagmar and her other siblings. The Glucksburgs' fortunes began to improve when the childless, and scandal-prone, King Frederick VII of Denmark recognized Prince Christian as his heir in 1852. Since the main line of the Danish royal family would become extinct upon Frederick VII's death, a royal heir had to be found. Prince Christian was not the closest relative to the throne, but his image was the least compromised by foreign entanglements. In the meantime, Dagmar and her ravishing elder sister, Alexandra, continued their education at the Yellow Palace. The early 1860's witnessed three events that brought the Glucksburgs to international prominence. First, Alexandra of Denmark married Edward, Prince of Wales; secondly, William of Denmark was chosen as the new King of the Hellenes, he adopted the name George I; and lastly, King Frederick VII died and was succeeded by Prince Christian under the name Christian IX. Suddenly, the matrimonial prospects of Princess Dagmar of Denmark were considerably improved. Her mother, now Queen Louise, had remained in contact with the Imperial Russian court, where she had wanted to find a substitute husband for her eldest daughter in the event that an alliance with Great Britain did not materialize. It is also important to note that Queen Louise and the Empress Maria-Alexandrovna, wife of Tsar Alexander II, came from two branches of the old German princely family of Hesse. Once Alexandra was safely married to the Prince of Wales, Louise directed her endless enthusiasm and perseverance, as well as her extended family connections, on attracting the attention of her Romanov cousins. By the end of 1864, her enterprise seemed complete when it was announced that Princess Dagmar of Denmark would marry the Tsarevich Nicholas Alexandrovich, heir of Tsar Alexander II. The Glucksburgs' matrimonial web seemed unstoppable, causing shudders in the Berlin chancellery where Otto von Bismarck ruled supreme. In 1863, after the death of Frederick VII, Bismarck orchestrated a war with Denmark over the control of the north German provinces of Schleswig and Holstein. By routing the Danish armies, Bismarck not only gained an important portion of territory, but also became the recipient of the undeterred hatred of the Glucksburgs. As the chancellor of the Prussian Hohenzollerns, Bismarck had solidified the Glucksburgs' deep dislike for anything close to Prussia. This dislike, as well as deep suspicion, would be passed along from Christian IX's children to his grandchildren, among them Tsar Nicholas II and King George V of Great Britain. Tragedy struck poor Dagmar when the Tsarevich suddenly fell sick and died in 1865. At barely eighteen years of age, Dagmar found herself without her dashing groom. None too soon her mother and future mother-in-law decided to marry Dagmar off to the new Tsarevich. Grand Duke Alexander Alexandrovich of Russia was a tall, well-built, strong man. Remembered by his family for his ability to bend iron rods, Alexander had been secretly in love with his deceased brother's future wife. Replacing Nicholas with Alexander was not to be a difficult task. On the other side, Dagmar slowly developed an intense love for her bear-like handsome new prince. Following Romanov court custom, Dagmar adopted the Orthodox religion under the name of Maria-Feodorovna. Soon after, Alexander and the newly baptized Maria were married in a sumptuous ceremony in St. Petersburg attended by many other royalty. Maria and Alexander's married life followed a leisurely path only interrupted by the arrival of children: Alexander inn 1867, Nicholas in 1868, George in 1870, Xenia in 1872, Michael in 1878 and Olga in 1882. Of the six imperial children, Alexander did not survive infancy, George died of tuberculosis in 1898, and Nicholas and Michael were killed during the Russian Revolution. During the bitter cold winter of 1881, this peaceful existence came to an abrupt end at the hands of terrorists. In the afternoon of March 13, 1881, Tsar Alexander II was assassinated outside the Winter Palace by leftist revolutionaries. His bomb-torn body was carried almost lifeless into the vast confines of the palace, and by darkness Russia had a new monarch, Alexander III. As a general rule, Maria-Feodorovna relished her role as the wife of Europe's most powerful monarch. She became the most elegant empress St. Petersburg had ever witnessed, and society followed her every whim. Maria-Feodorovna fulfilled her role to perfection, bringing an enormous degree of elegance to a court sorely famous for its wasteful decadence. The new empress also, though indirectly, influenced her husband's deep suspicion of Bismarck and Hohenzollern Germany. Hatred of all things German, anyhow, had become a trademark of the Glucksburgs. Like her sister Alexandra of Wales, Maria-Feodorovna was a devoted, doting mother who spoiled her children. She refused to let her five surviving children to grow, particularly her eldest son, the future Nicholas II. Consequently, the imperial children were completely unprepared for the role history had in store for them. Tsarevich Nicholas was most unsuited for the role of Tsar of Russia, a reality expressed by Nicholas himself soon after his father's death when he lamented "what is going to happen to Russia?....I am not prepared...I know nothing of the business of ruling." When Tsarevich Nicholas Alexandrovich asked his parents for permission to marry Princess Alix of Hesse and by Rhine, Maria-Feodorovna opposed her son's wishes. She feared that the arrival of this German princess, who was a granddaughter of Queen Victoria, was going to diminish her influence with Nicholas, and even displace her from her son's adoring heart. Nicholas nonetheless insisted on his choice. Physically exhausted, and fearing that their opposition to Alix would estrange them from Nicholas, Alexander and Maria-Feodorovna were forced to relent. The fact that Tsar Alexander III was at death's door played no small role in Maria-Feodorovna's decision. Alexander III's reign came to an abrupt end on November 1, 1894. The Tsar had been suffering from nephritis and his massive body was unable to fight off the disease. Transported to the Black Sea imperial palace at Livadia, Alexander lingered for weeks while clinging to the last shreds of his once bear-like frame. It was at Livadia that Alexander's reign ended and Nicholas' began. Shortly before Alexander III's death, Princess Alix had hurriedly traveled to Livadia to be near her future husband and in-laws. Alix converted to the Orthodox religion and adopted the name Alexandra-Feodorovna. The couple married on November 26, 1894, in St. Petersburg. The Imperial court was still in mourning for the death of Tsar Alexander III. It was not an auspicious beginning for the new reign. Alexandra-Feodorovna came from the minor German court at Darmstadt. 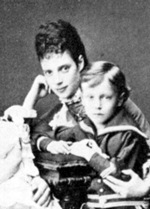 Her mother, Princess Alice of Great Britain, had died in 1878 when Alexandra-Feodorovna was but six years of age. Consequently, Alexandra-Feodorovna was raised under the supervision and strict guidance of her grandmother, Queen Victoria. Needless to say, poor Alexandra was not well-suited to fill the role left empty by her dashingly glamorous mother-in-law. Nor was Maria-Feodorovna willing to abandon her position as the glittering doyen of St. Petersburg society. Her coldness toward Alexandra contributed to the latter's further alienation from the Russian imperial court. Alexandra, who did not have an ounce of frivolity in her character, was only too happy to allow her husband's mother the space Maria-Feodorovna's imposing figure demanded. While the Dowager Empress, as Maria-Feodorovna was known after her husband's death, ruled St. Petersburg, Empress Alexandra dedicated all her time to securing her husband's complete love, trust and devotion. This interdependence between Nicholas and Alexandra would alienate them from the Imperial family and doom their reign as Russian monarchs. The rift between the imperial couple and the imperial family contributed to the rising instability within Russia. Nicholas was torn between his family's constant meddling in affairs of state, and his wife constant prodding to act more decisively. Alexandra's inability to produce a male heir, after the birth of four beautiful daughters, led to considerable rumblings against her. And to worsen the situation, once the heir arrived in 1904, the poor little boy was afflicted with the dreaded "royal" disease, hemophilia. In what became the worst mistake ever made by the imperial couple, Nicholas and Alexandra decided to keep their son's disease a secret, robbing themselves of the understanding and compassion of the Russian people. Instead, as the imperial couple's life became more secluded and secretive, the rumor mills gained speed. Slowly, but surely, Alexandra and Nicholas' reputation was eroded by wild tales about the child's afflictions. Further erosion of Nicholas and Alexandra's prestige came about with the arrival of the mysterious monk commonly known as Rasputin. Grigori Efimovich, a Russian peasant, claimed to hold mystical powers capable of curing every illness. Alexandra, counseled by the mysticism-prone Grand Duchesses Militza and Anastasia, daughters of King Nicholas of Montenegro, allowed Rasputin entry into the imperial apartments. Mystical or not though, Rasputin's presence transported the young Tsarevich Alexis into a stupor which would stop his profuse bleedings. As she sough to keep her son alive, Alexandra fell under the spell of the pernicious monk. Unfortunately for Alexandra, Nicholas and their children, and due to the secretive nature of the Alexis' illness, Russia was never allowed to understand Rasputin's soothing role. Gossip mongers at court spread all sorts of rumors alleging serious sexual improprieties between Alexandra, her daughters and Rasputin. Secluded in the vast confines of the Alexander Palace at Tsarskoe Selo, Alexandra continued her secluded existence, unknowingly allowing the rumors to spread. In the meantime, The Dowager Empress Maria-Feodorovna realized her complete inability to exert any further influence with her son. She could no longer convince Nicholas II to eradicate Rasputin's influence from the imperial household. Nicholas, mortified by his son's suffering and blinded by his devotion to Alexandra, refused to heed the advice of his mother. The gulf between the Tsar and his family gradually widened until it was unbridgeable. After her husband's death, forty-seven year old Maria-Feodorovna spent a considerable amount of time carrying out her duties as Dowager Empress. Her charities consumed great efforts, as did her involvement in Petersburg society. More often than not, Maria-Feodorovna spent a considerable amount of time traveling to Europe to visit family in Copenhagen, London and Athens. She also acquired a villa, Hvidore, in the Danish countryside where she usually retired with her sister Alexandra. Summers would find her cruising the seas aboard her luxurious yacht, the Polar Star. It was during this period when the adventures of her children gave her much to worry about. Grand Duchess Xenia had married the Grand Duke Alexander Michaelovich, her father's first cousin. Grand Duke Michael had resisted contracting a royal marriage and finally opted to elope with a twice-divorced woman by the name of Natasha Wulfert, his longtime mistress. The Dowager Empress felt yet another disappointment when the marriage she had arranged for her youngest daughter Olga, to Duke Peter of Oldenburg, collapsed. Maria-Feodorovna had arranged this marriage, much to Olga's opposition, to keep her daughter within Russia. Peter on the other hand, a known homosexual in St. Petersburg, saw the opportunity represented by an arranged marriage to Olga: an enormous dowry and social position as the Tsar's brother-in-law. Needless to say, the marriage of Olga and Peter brought nothing but disappointment and frustration to all involved. The war years saw Maria-Feodorovna contributing to the Russian war efforts as head of the Russian Red Cross. She continued her charities and was constantly seen visiting hospitals and comforting wounded soldiers. It was during this time, when Russia's government seemed adrift, that the Dowager Empress lost complete faith in her daughter-in-law's involvement in governing the empire. Like many other Romanovs, Maria-Feodorovna desperately tried to convince her son that Alexandra's involvement in affairs of state was eroding the monarchy's support. As Russia's military woes piled and the army turned into a disorganized embarrassment, Nicholas and Alexandra were blamed for the disasters affecting the country. Maria-Feodorovna even brought to her son's attention the pernicious rumors caused by Alexandra's relationship with the dirty Rasputin. All her complaints were brushed aside by Nicholas, who rarely wavered his support for Alexandra. The revolution that toppled the Romanovs came as no surprise to many members of the imperial family. Only Nicholas and Alexandra seemed shocked by the Russian people's decision to overthrow a regime that had epitomized inefficiency and corruption. Maria-Feodorovna had one opportunity to see Nicholas II just after his abdication in early 1917. After a brief encounter with her son, the Dowager Empress headed towards one of the imperial villas in the Crimea. While revolution spread throughout Russia, Maria-Feodorovna was joined at her seaside refuge by Grand Duke Alexander and Grand Duchess Xenia, their six sons, Prince Yussupov, his parents and his wife Grand Duchess Irina, daughter of Xenia and Alexander, and Grand Duchess Olga and her new husband Colonel Koulikovsky. Nicholas and Alexandra, along with their children, were sent into exile in the provinces. The imperial couple were initially sent to Tobolsk, and later on moved to Yekaterinburg, near the Ural Mountains. They were all assassinated by Bolshevik guards in Yekaterinburg in July 1918. Grand Duke Michael was also apprehended and eventually executed while in prison during the summer of 1918. Not content with the massacre of these Romanovs, Bolsheviks went around the civil war torn country trying to execute all remaining Romanovs. The year 1918 also saw the assassination of the following Romanovs: Grand Duke Paul Alexandrovich, uncle of Nicholas II; Grand Duke Nicholas Constantinovich, grandson of Nicholas I; three children of Grand Duke Constantine Constantinovich: Ivan, Constantine and Igor; Grand Duke Dimitri Constantinovich, grandson of Nicholas I; Grand Dukes Nicholas Michaelovich, Serge Michaelovich and George Michaelovich, grandsons of Nicholas I; Grand Duchess Elizabeth, widow of Grand Duke Serge Alexandrovich and sister of Tsarina Alexandra Feodorovna. Prince Dimitri Pavlovich Paley, son of Grand Duke Paul Alexandrovich, was also assassinated. In all nineteen Romanovs were brutally executed by the blood-thirsty Bolsheviks. The imperial family never recovered from this tragedy. Maria-Feodorovna and her surviving family left Russia in the spring of 1919. They boarded the British ship HMS Marlborough and never again set foot in their country. For a time Maria-Feodorovna stayed in London, the guest of her sister Alexandra and her nephew George V. Eventually she returned to Denmark where she occupied rooms at the royal palace in Copenhagen and spent time at Hvidore. She never accepted the fate of her sons and grandchildren, and in fact continued hoping that they all had managed to survive the revolution. Yet around her, life seemed to have frozen as all her loved ones slowly disappeared. Only the faint memories of her glamorous life in Russia remained, for by the time she died even her looks and mind seemed to be but a memory. Maria-Feodorovna passed away quietly on October 13, 1928.